IT has been a recurring theme for the past five months – and Saturday’s convincing 2-0 win over Queen’s Park proved to be no different. 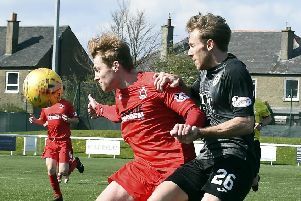 Edinburgh City’s prolific strike force of Blair Henderson and Scott Shepherd were at it again, grabbing the headlines as they continue to tease and torment defences across each division of Scottish football. The Citizens were returning to league duty after their recent cup exploits against Alloa and Inverness Caledonian Thistle over the past fortnight. However, this victory ensured an impressive ninth clean sheet of the season for goalkeeper Calum Antell, who arguably hasn’t received the recognition he deserves, according to Shepherd. The 22-year-old affirmed the importance Antell has played in their terrific domestic form, stating: “Calum has been different class for us. “He maybe doesn’t get the headlines as much because it’s usually goalscorers that seem to grab them, but he’s kept us in several games and made a lot of clean sheets this season. “The winning run we went on will be a hard record to beat and Calum played a massive part. You need a goalkeeper like that if you want to stay top of the league. “Personally, it’s good to obviously get on the scoresheet again and my goal against Alloa a few weeks ago has given me a lot of confidence. I probably should’ve done better with an earlier chance I snatched at, but I had more time and space to finish the second one. This match took a while to get going at an overcast Ainslie Park with the home side narrowly shading the early proceedings. Graham Taylor, who netted both goals in the previous meeting at Hampden in September, seems to enjoy facing the Spiders as he caused problems down the visitors’ right-hand side on several occasions. The winger robbed full-back James Grant in a dangerous area early on before finding Shepherd who failed to hit the target from the edge of the box. Taylor used his pace and trickery to cut inside in the 14th minute and scoop up a ball for Blair Henderson but the big forward couldn’t keep his header down. Queen’s continually gave away needless fouls deep in their own half and they almost paid the price after 28 minutes. Craig Thomson’s free-kick evaded everyone bar the unmarked Conrad Balatoni who came within an inch of turning the ball past Jordan Hart at the back post, but the young keeper did enough to thwart the danger. However, just two minutes later James McDonaugh’s side did open the scoring when the visitors’ defence failed to clear Robbie McIntyre’s corner. The ball broke to Balatoni who knocked it down into a cluster of bodies and Blair Henderson reacted quickest to prod home from close range for his 19th goal of the season. Shepherd then gave City a two-goal cushion just two minutes later after a clever sweeping move involving Allan Smith and Mark Laird. The forward was granted acres of space and picked his spot to perfection, drilling a low effort past the helpless Hart into the bottom corner of the net. Queen’s Park had given themselves a mountain to climb but, to their credit, they grew into the game in the second half and Antell had to look sharp to deny Dom McLaren and then Kieran Moore in quick succession. However, The Spiders ended the game with ten men after McLaren received a second yellow card for two rash challenges on Bkair Henderson, before Livingston loanee Adam Watson went close to increasing City’s lead at the death. Shepherd believes the result has set them up perfectly for Tuesday night’s trip to the Highlands to face Inverness in their Scottish Cup third round replay after the team drew 1-1 at Ainslie Park. Edinburgh City: Antell, Thomson, McIntyre (Rodger; 74), Black, Balatoni, Laird, Smith, B. Henderson, Taylor (Watson; 68), Shepherd, L. Henderson. Unused subs: Morton (GK), Hall, Kennedy, Lumsden. Queen’s Park: Hart, Grant, Summers, McKernon, McLauchlan, McLaren, East, Roberts, Hawke (Trialist; 62), Moore, McLean (Magee; 78). Unused subs: McDougall (GK), Fotheringham, Martin, Kindlan, Peters.